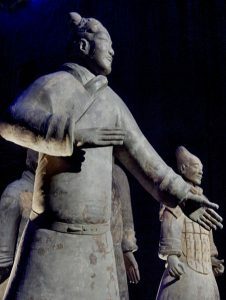 The Terracotta Army is one of the greatest archaelogical discoveries in history, and one of the biggest, and most interesting burial complexes anywhere in the world. 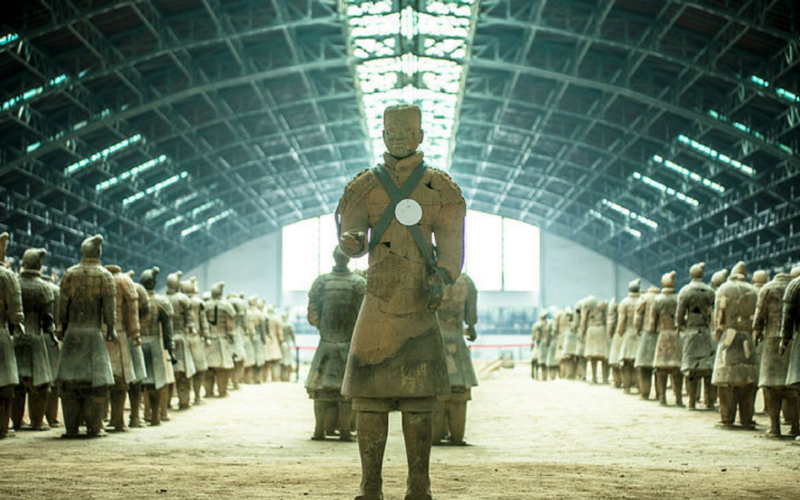 Inside the gigantic underground complex which is still being uncovered, hides thousands of clay soldiers guarding the unopened tomb of china’s first emperor. 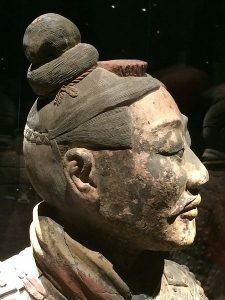 Emperor Qin Shi Huang built the Terracotta Army over 2000 years ago. 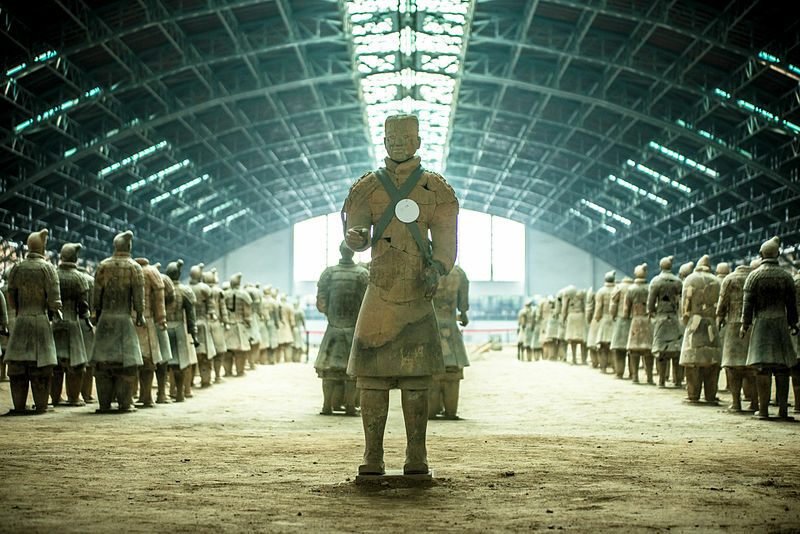 The Terracotta army was created by Emperor Qin Shi Huang, the first emperor of China. He was buried with it in a gigantic tomb in 210 BC. The soldiers were built with the intention of protecting the emperor in the afterlife. 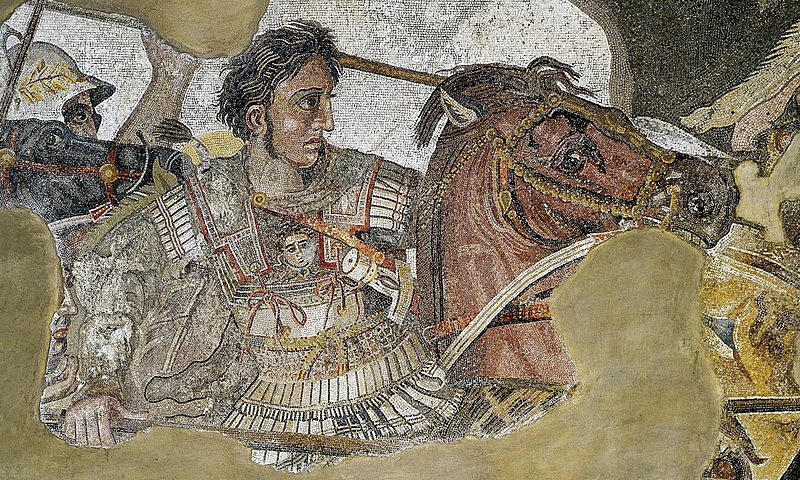 8,000 soldiers are buried in the complex with him, and although the statues are primarily soldiers meant to protect him, there are also statues built to entertain him. There were acrobats and strongmen. There were even government officials buried with him. The emperor was well prepared for his time in the afterlife, and was buried with everything he would need. 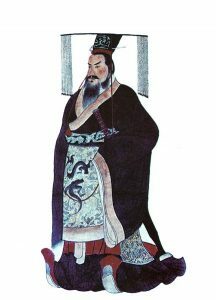 Qin Shi Huang was the founder of the Qin dynasty, and the first emperor of china. He became emperor at the age of 38. Qin Shi Huang was desperate to uncover the secret of immortality. He was so afraid of dying that he never slept in the same place twice and carried a large crossbow wherever he went. He had underground passageways constructed so that he could travel anywhere completely unseen. While waiting for the Terracotta Army to be built he consulted apothecaries, spiritualists and soothsayers, hoping to find a way to become immortal. He dreamt that he would be killed by a giant sea creature and set out to kill it first. After killing a beached whale he fell ill and died just a few days later. 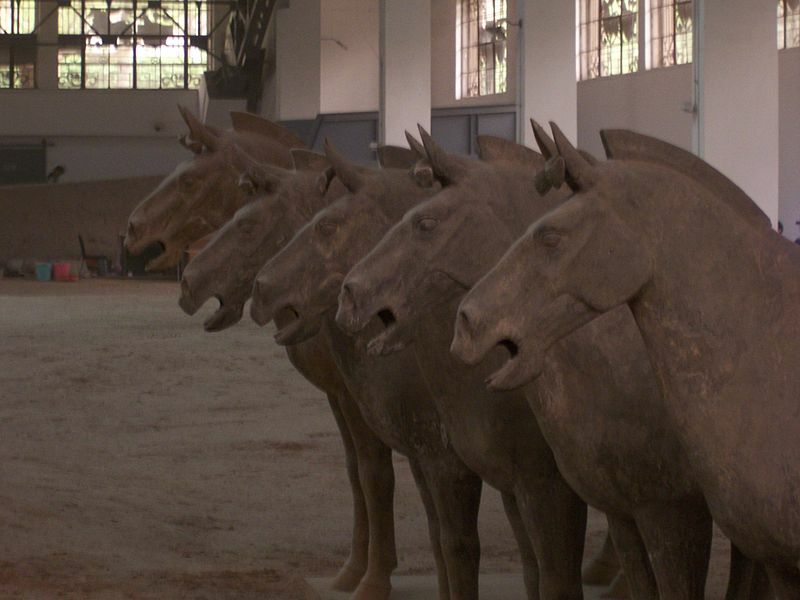 An amazing new discovery has found that the Greeks may have actually helped the Chinese build the Terracotta army. DNA found in remains in the complex have revealed that Europeans were probably in China 1,500 years earlier than we thought. It’s likely that Europeans didn’t just visit but actually settled down with Chinese civilians. Evidence shows that the statues might have been partly built by Europeans, and inspired by Greek statues. The archaeologists also found the skull of Prince Fu Su, it had a crossbow bolt embedded in it. It was so huge that it took 700,000 workers to build, and it took all of them nearly 30 years. It still isn’t completely discovered, pit one alone is 750 ft long. The complex is 20 square miles, and contains thousands of uniquely sculptured statues. The statues are mainly foot soldiers but there are also cavalry, high ranking officers like generals, and chariots. There are four pits in total most are filled with statues, but the last one remains mysteriously empty, it’s possible that this one was never finished, or it’s purpose simply still a mystery to us. The most interesting and enigmatic part of the complex is the tomb itself, where the emperor is buried. His body is hidden inside and no one is allowed to enter. And even if we were allowed to enter it, we wouldn’t have to technology to go in safely anyway. Yet inside may lie answers to some of the most interesting questions. Excavating is an incredibly precarious endeavour, and just air or sunlight can damage artefacts. It’s impossible to say when we will be able to find out what’s buried inside. His tomb is surrounded by rivers of mercury, deadly to humans, but at the time they believed it could grant them immortality. It’s even possible mercury is what killed the emperor as he tried to attain immortality. Qin held an iron grip on china after unifying it, at the end of the Warring States Period. 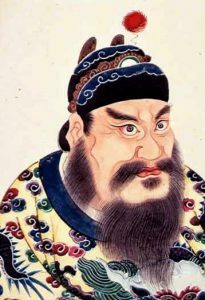 Qin had no tolerance for opposing ideas, and quickly killed anyone who put forward ideas he didn’t like. He didn’t show much about care about the lives of labourers, many of which would have died or suffered painful injuries while constructing his tomb. Although he was cruel he was an excellent leader and managed to advance his country many aspects. He is also said to have burned many books, and made others illegal to read. China was far ahead of it’s time technology wise, they used a protective chrome plating to preserve their weapons that wouldn’t be seen again for around 2000 years. This has kept their weapons incredibly well preserved even to this day. It’s amazing that thousands of real weapons from that time could be found so well preserved in this tomb. Around 40,000 weapons have been found. 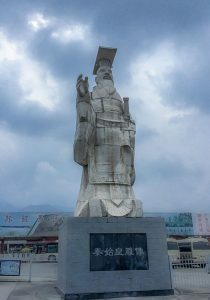 Experts have revealed that the Qin army was mighty because of it’s strict military systems, wise leadership, and a well trained army. Amazingly the weapons are still shiny, and still sharp. Each soldier in the army is unique from the other, they have unique facial features, height, and even the shape of their bodies is different. The average height is 5 ft 11 in, but some almost go up to 7 ft. The soldiers are in formation, like a real army. After the emperor died many of the statues were vandalised and damaged which could be because they felt the emperor was too cruel. The statues are expertly made, with a level of detail only skilled workers could achieve. It’s possible that they were taught by Greek sculptors. 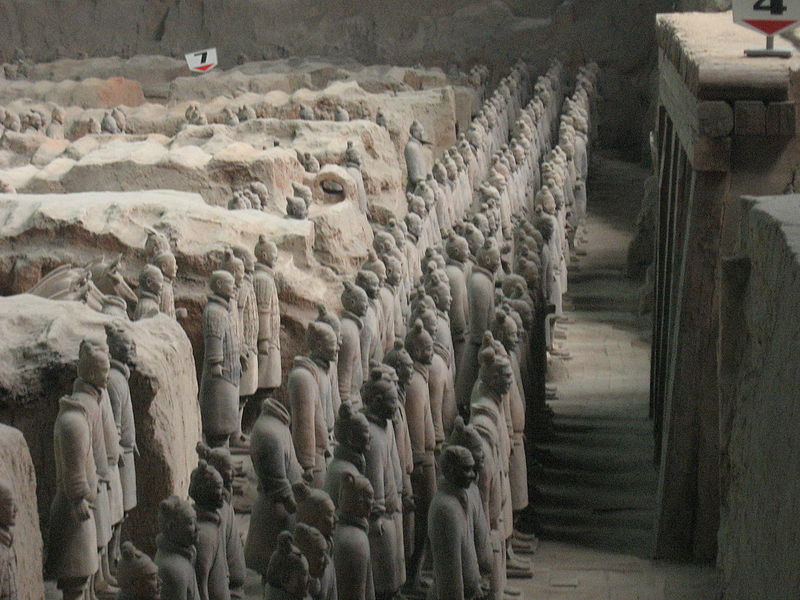 The Terracotta Army was discovered on 29 March, 1974, to the east of Xi’an in Shaanxi province. Some farmers were digging a water well near the emperors tomb, when they were shocked to discover the immense burial complex. People had been finding random pieces for hundreds of years. Yang Zhifa discovered the first warrior while digging a well, he actually thought is was kiln at first, and was hoping he’d get some free jars. When they realised it wasn’t a kiln but actually a statue they thought it might be an old temple. It didn’t take too long for them to realise they might have something quite significant and took it to an expert to be appraised. Yang eventually made a decent amount of money from it, and even became a local celebrity. The statues were built to protect the emperor in the afterlife. He believed that statues could be reanimated in the afterlife and act as an army there just like it did in real life. He expected to hold the same martial power, and live the same luxurious life when dead as he did while alive. Before this time, they used to use human sacrifices for this, and rulers were buried with actual humans. 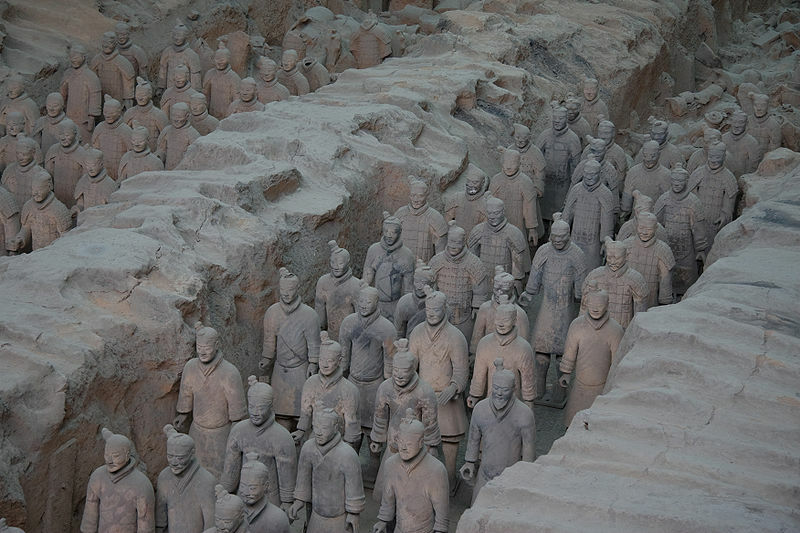 Qin decided to abandon this and choose statues instead, perhaps because of the sheer number he wanted to have.